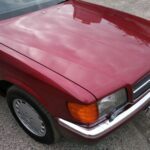 Almandine Red metallic with Mushroom leather interior, 4 speed switchable automatic, electrically adjustable steering column, tilt/slide electric sunroof, 4 x electric windows, cruise control, air conditioning, heated electric memory front seats, electric seatbelt feeders, electric mirror, leather steering wheel, leather gearknob, illuminated vanity mirrors, front and rear armrests, front and rear headrests, headlamp wash/wipe, ABS, original 15 hole alloy wheels, recent Sony radio/CD/Bluetooth player, remote central locking/alarm/immobiliser, all original tools and manuals, full service history all with MB dealers, 94,000 miles. 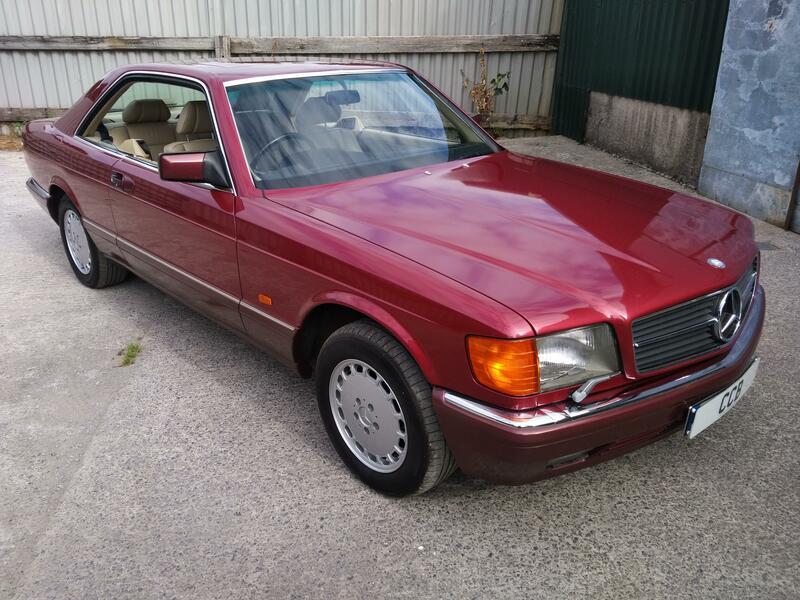 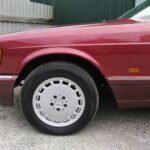 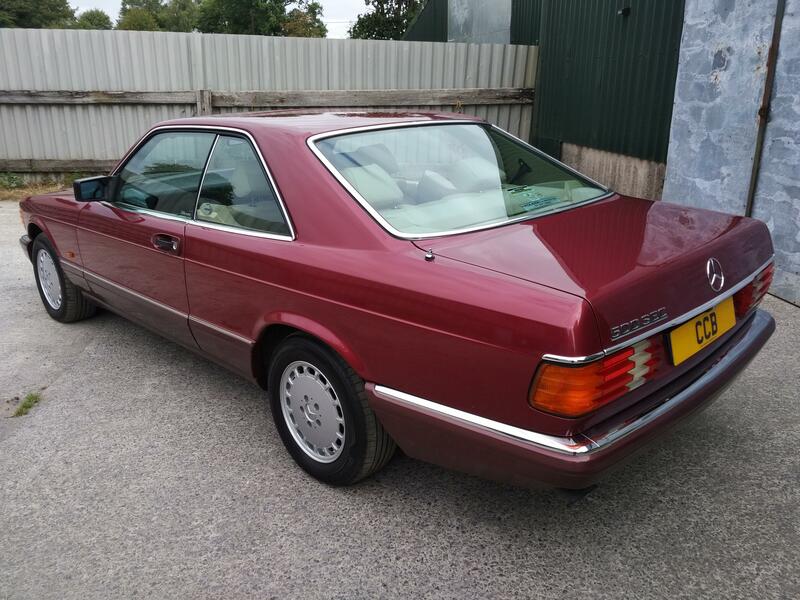 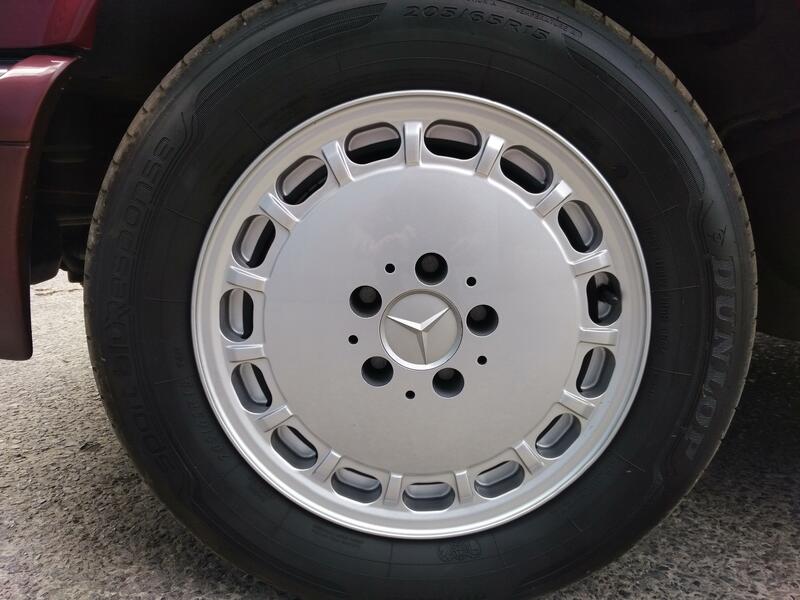 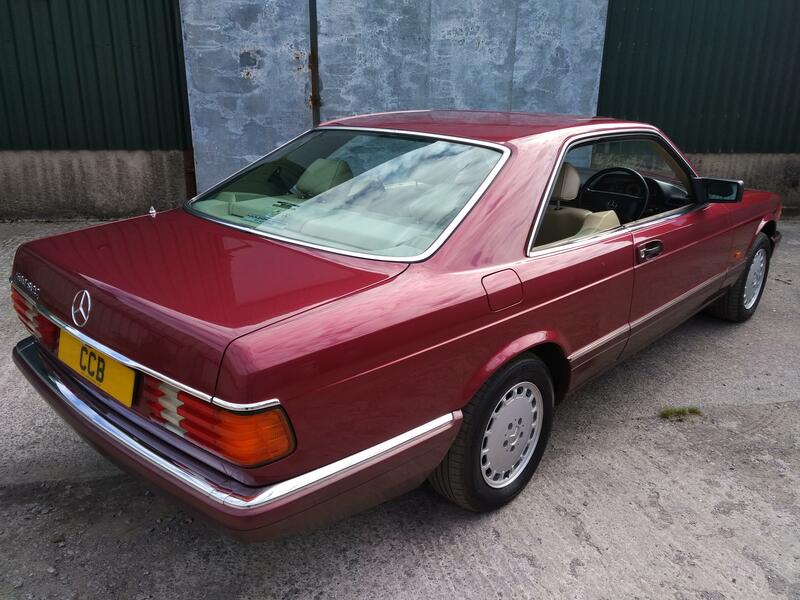 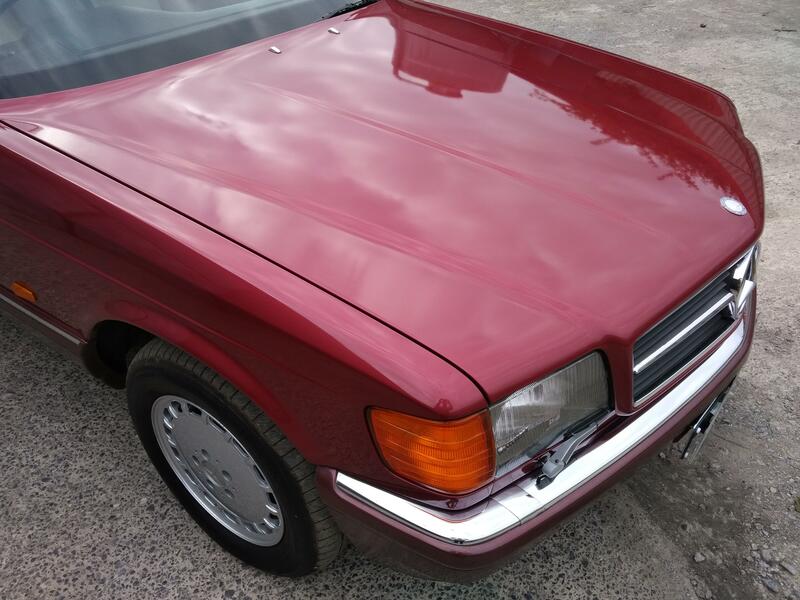 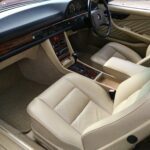 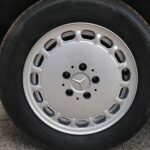 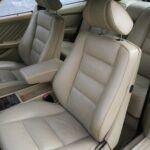 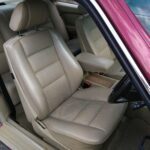 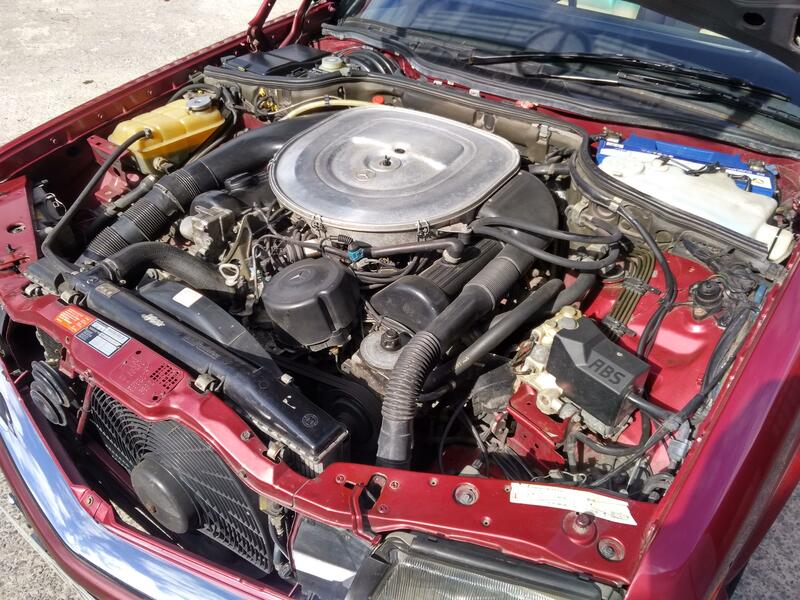 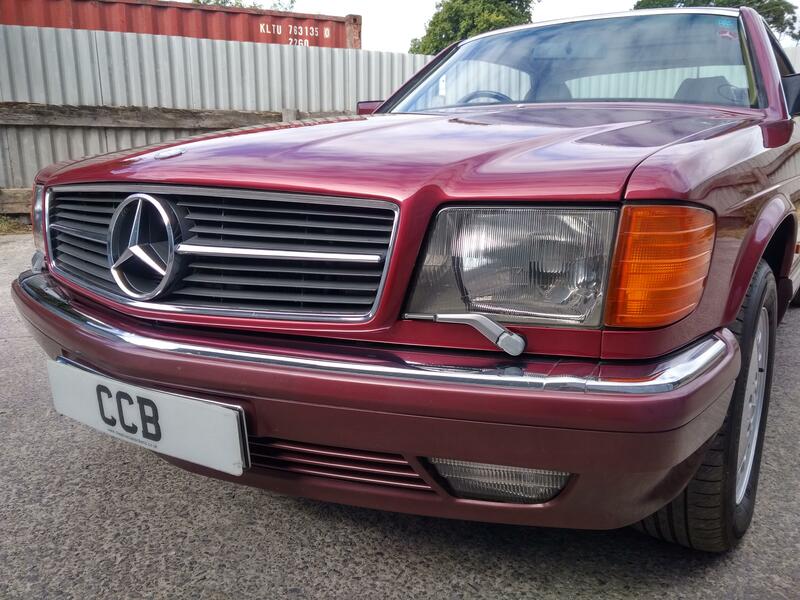 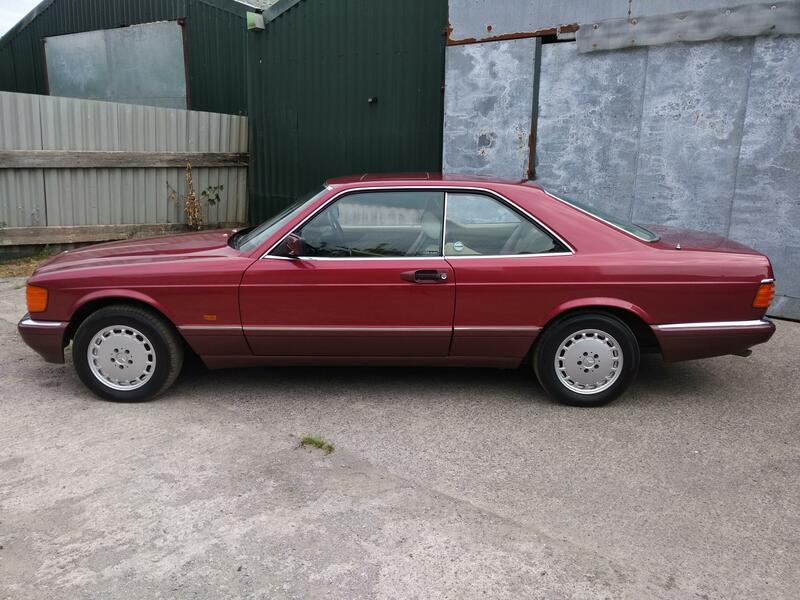 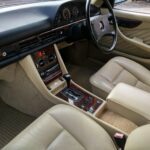 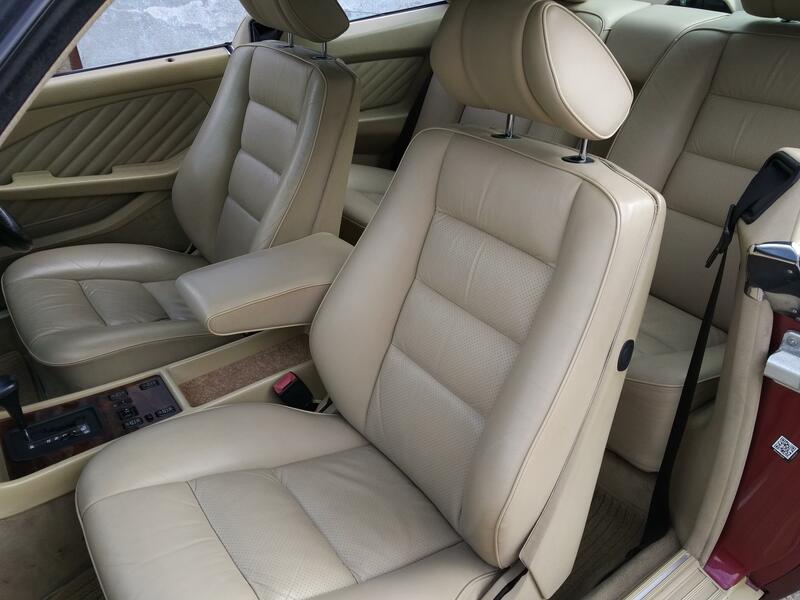 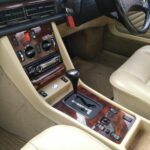 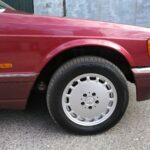 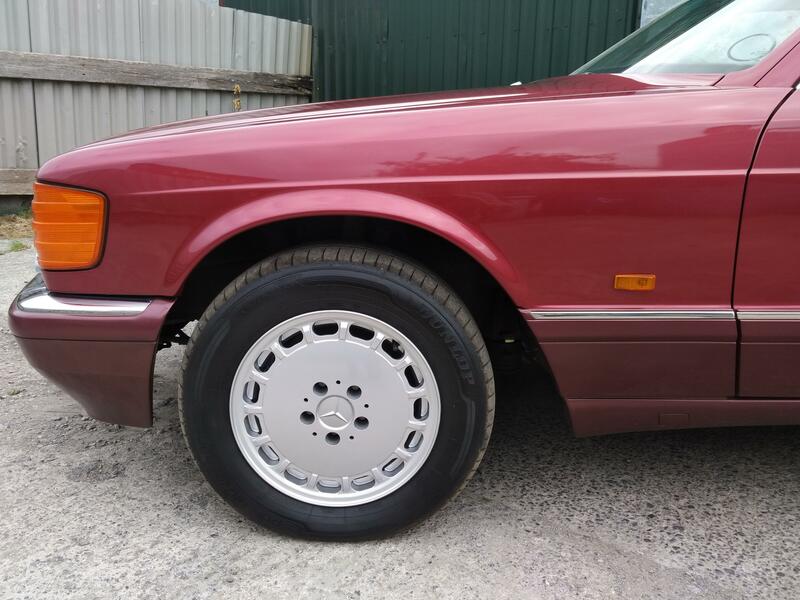 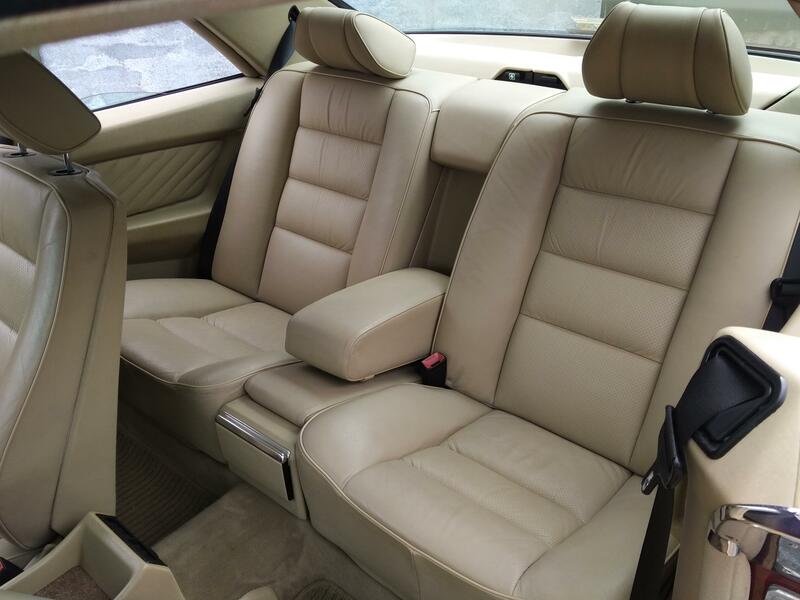 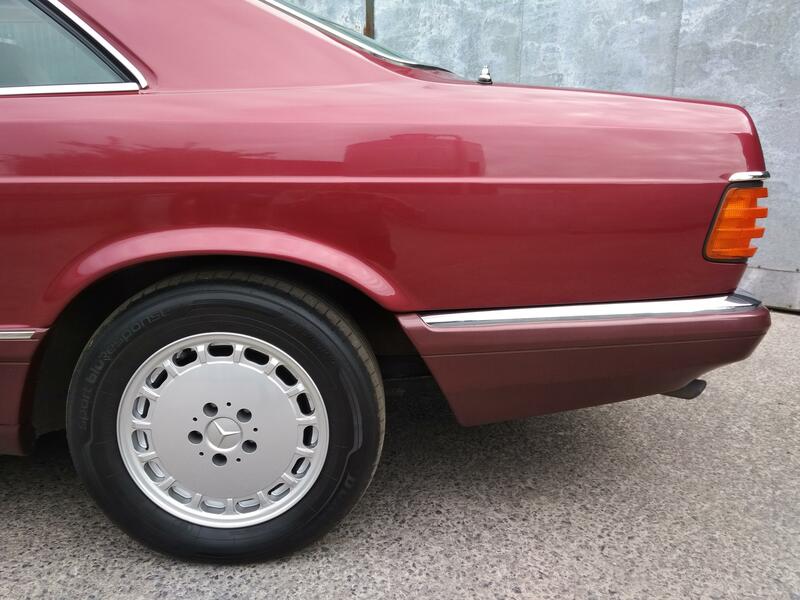 This car represented the pinnacle of Mercedes-Benz technology and build quality when it was supplied new in 1990, and it is fitted with virtually every comfort and safety option then available. 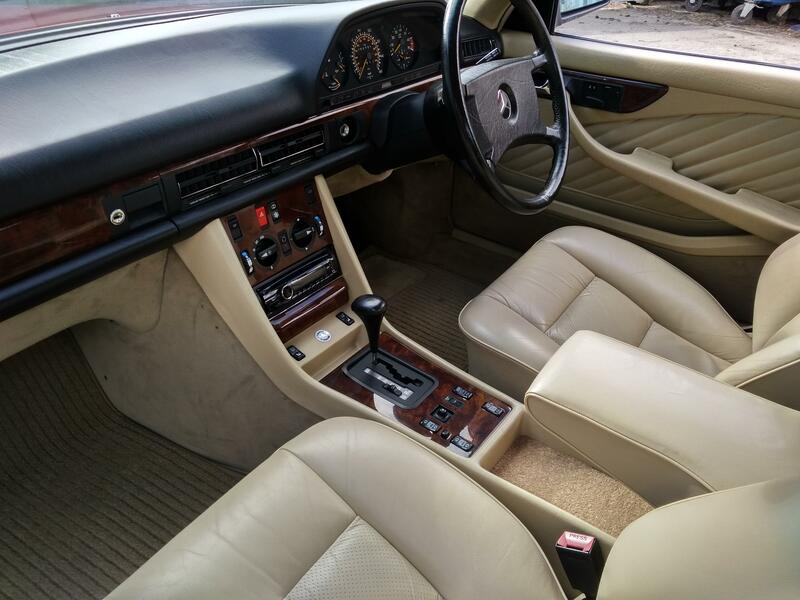 It still outclasses many much more recent cars in terms of comfort, refinement, performance and presence on the road. 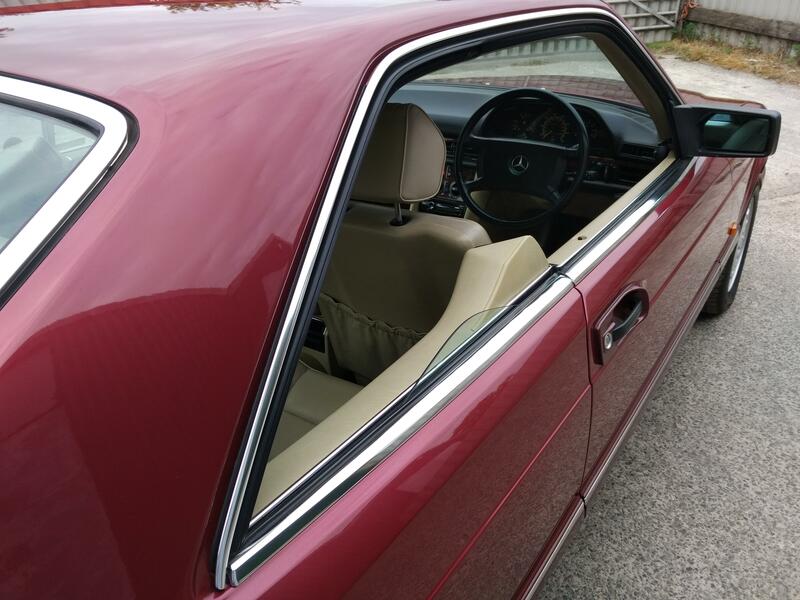 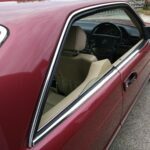 When the model was new its styling was thought to be breathtakingly fresh and elegant, and the years have done nothing to temper that impression. 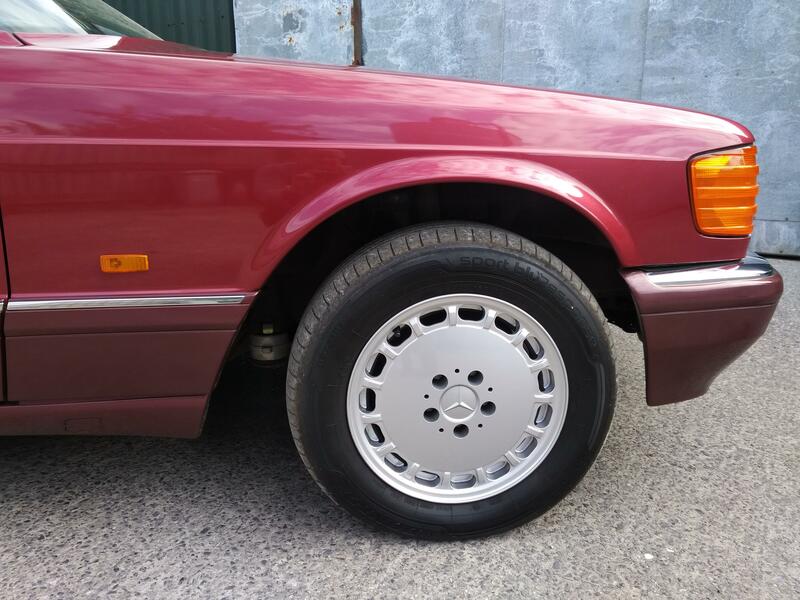 Viewed against more modern offerings it has a purity of line that has not often been seen since. 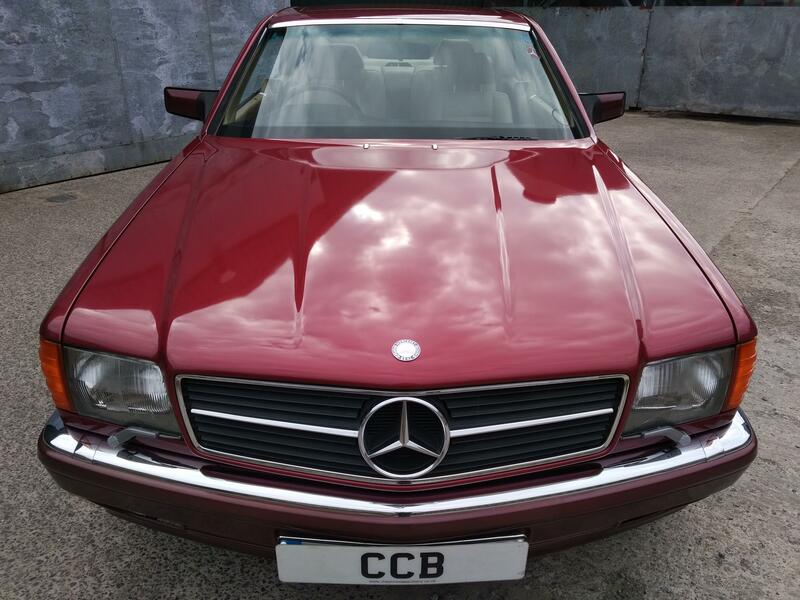 The pristine metallic burgundy paintwork gives the car an understated but imposing look, contrasting perfectly with the unmarked soft cream leather interior. 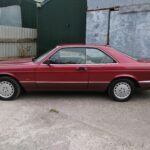 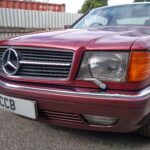 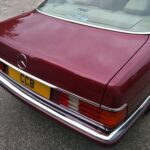 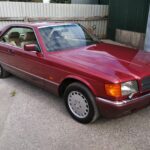 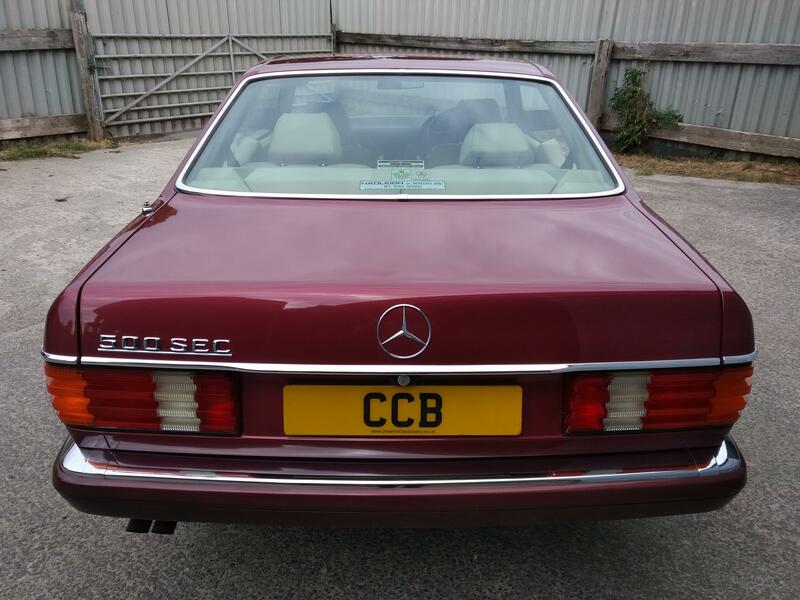 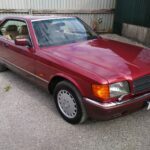 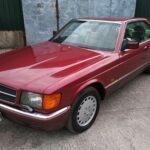 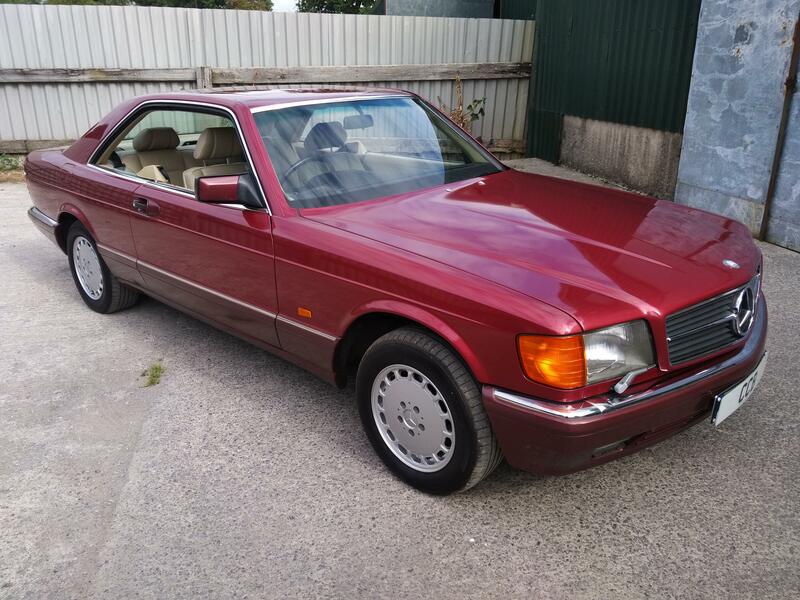 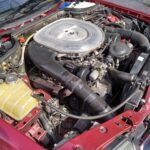 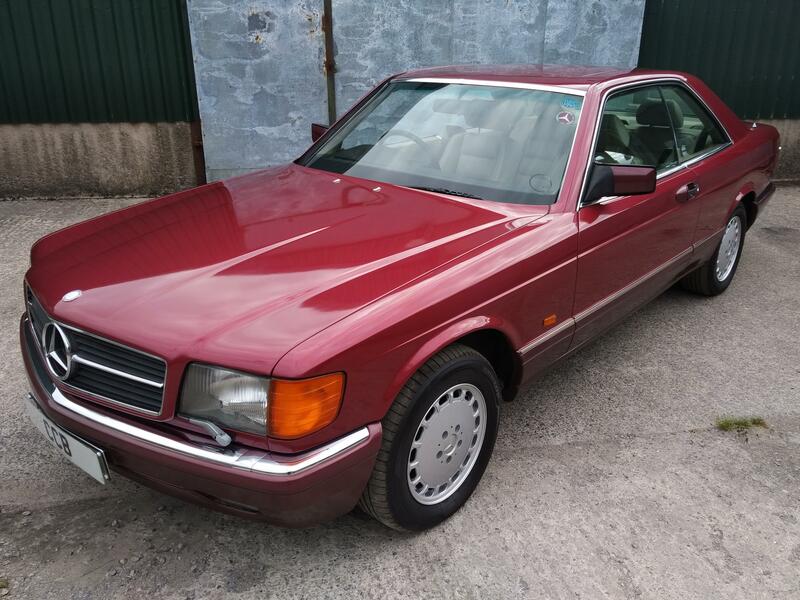 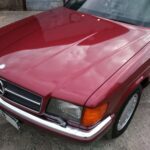 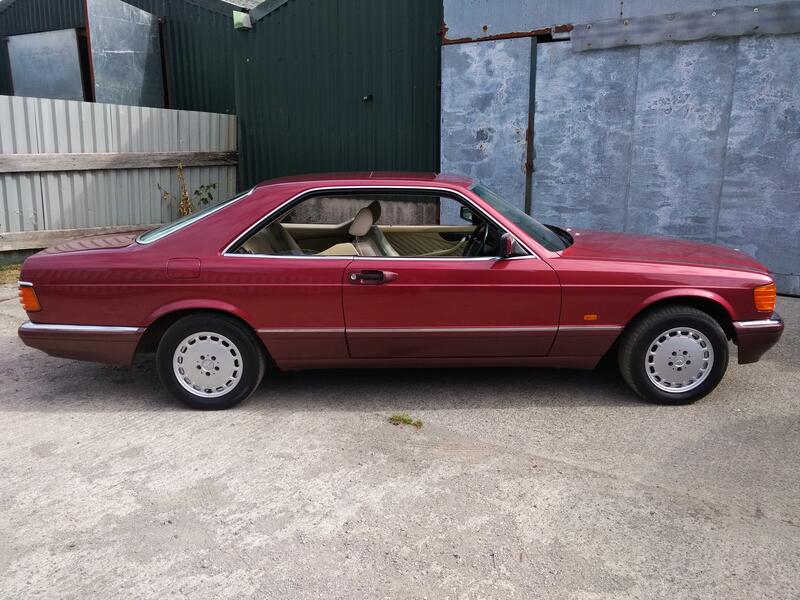 It was supplied new in January 1990 by the Mercedes-Benz dealer in Nicosia, Cyprus at the time when personally importing a car to the UK was a very popular way of reducing costs. 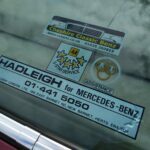 Within four months it had been sold to its first UK owner, a property company director from Enfield, by Hadleigh Mercedes-Benz of New Barnet, and their sticker is still in the rear window. 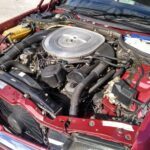 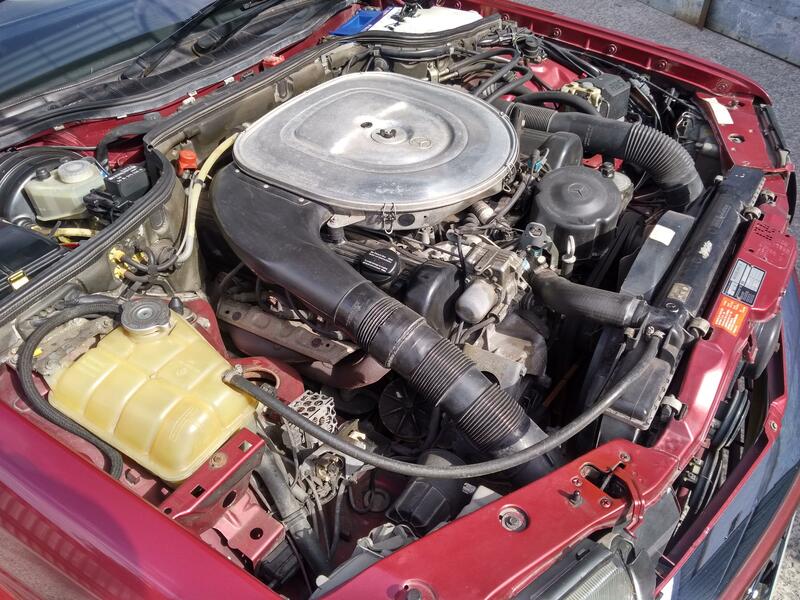 He kept the car for eight years until October 1998, covering around 55,000 miles in that time. 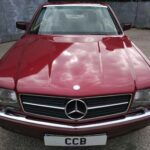 It then went to a gentleman in High Wycombe , who kept it for five years until November 2003, increasing the mileage to around 67,000. 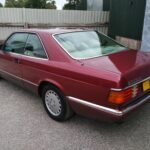 Another High Wycombe resident then owned it for nine years until January 2012, taking the mileage up to around 75,000. 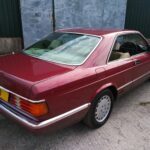 There were then another four registered keepers in the period 2012 to 2016 in Surrey and Scotland before it came to us. 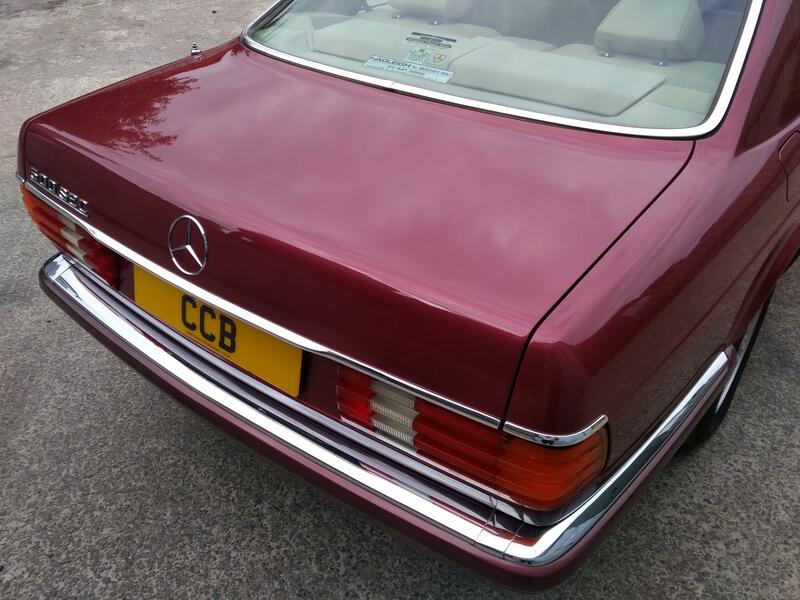 In February 2017 we sold it to a gentleman in Cork, Ireland, where it was intended to form the basis of a classic Mercedes collection. 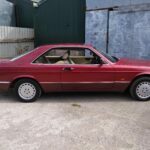 He has kept it in fine condition and has hardly added to the mileage total, but a change of circumstances has meant that he has now had to relinquish it to fund a property development, so it is now once again available to a new owner. 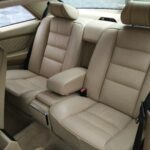 The service history for this car is excellent. 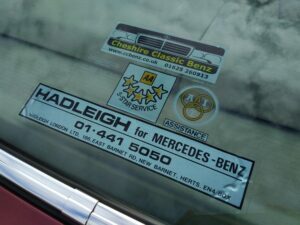 The service book contains 20 stamps from franchised Mercedes dealers, for which we have the invoices on file for the majority. 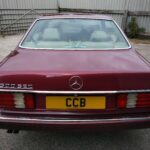 In addition there is one stamp from ourselves before we sold it to its latest owner. 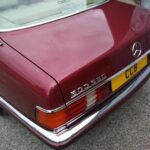 We also have many invoices for unscheduled work, again all from franchised Mercedes dealers, and every MOT certificate back to 1998, all showing a dedication to maintaining the car regardless of expense by all of its owners. As well as always being properly maintained, the car has been very well looked after physically. 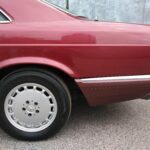 Every aspect of bodywork, paint, brightwork, glass, wheels and trim are immaculate, with hardly any detectable wear. 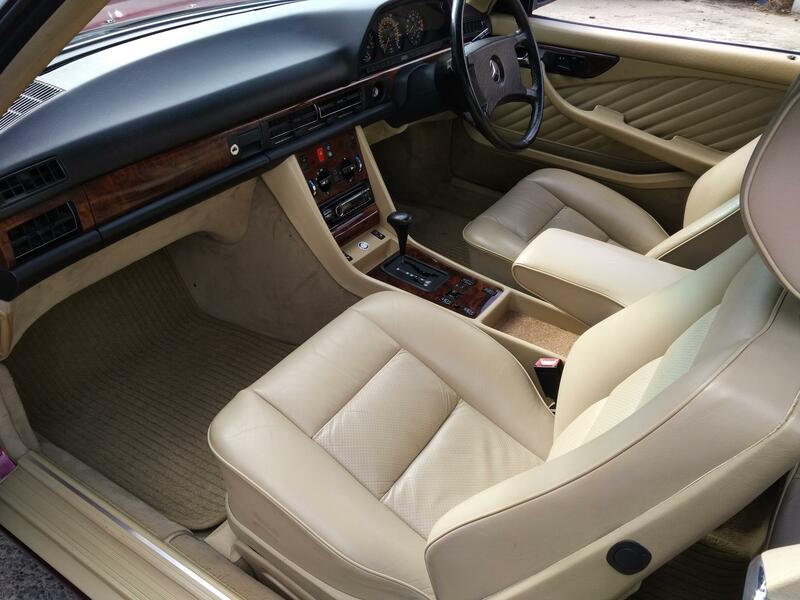 From behind the wheel the impression is of smooth silent perfection, with ample space and every comfort for four passengers over any distance. 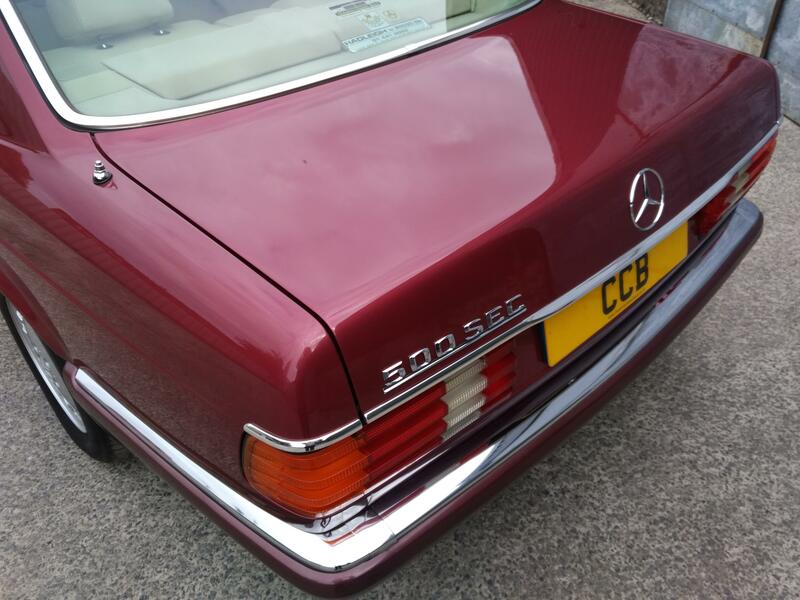 Cruising is absolutely effortless and acceleration very impressive, with just a distant V8 growl when progress becomes more urgent. 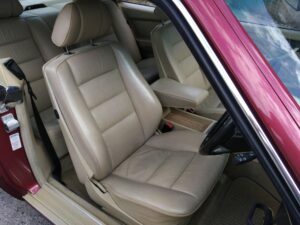 By contrast, slow speed handling is very precise, and thanks to the very tight turning circle and light throttle the car feels much smaller than it really is when maneuvering. 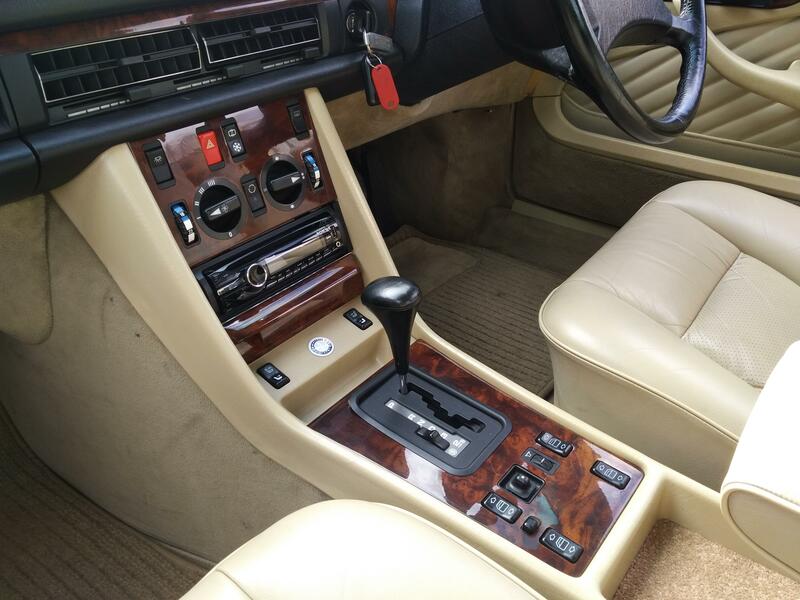 This is a very special car, and one which will be a lasting pleasure for its new owner. 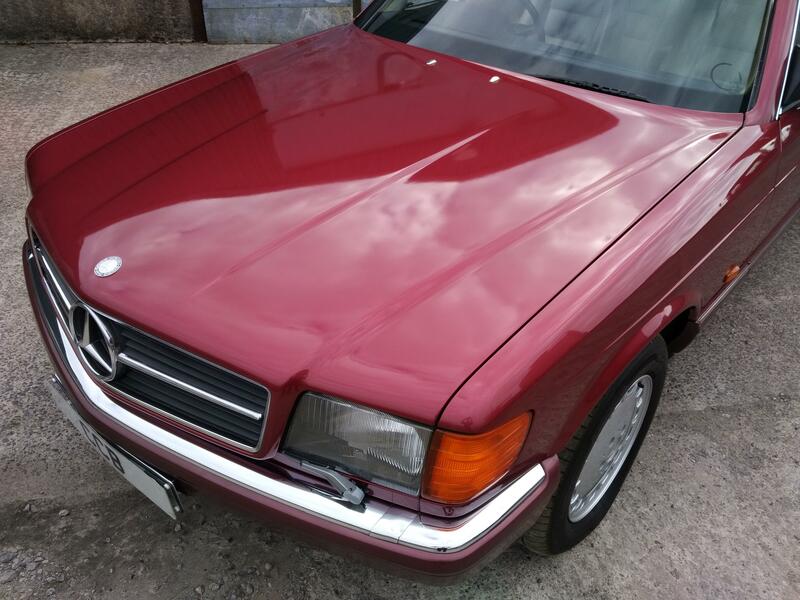 The number of top condition, low mileage examples of this model remaining is now very small, which can only mean that its value will increase in future years provided it is looked after in the way that it has been to date.